Fluorescent lamps, including energy saving compact fluorescents, contain mercury. When a lamp breaks, it releases mercury into the air, which is toxic to the human nervous system and can poison wildlife. Fishing in many New Jersey water bodies is restricted due to mercury contamination. When a lamp breaks, projected shards of glass may injure eyes or skin. See the instructions below regarding the handling of a small quantity of broken lamps. Do not Vacuum!!! Store lamps in box or case to prevent breakage. Keep out of reach of children or pets. Wear glasses when handling lamps. However, if you are concerned about the risk to your health from a potential exposure to mercury, consult your physician. Universal Waste Rule Requirements Under the EPA universal waste rule, a lamp that does not pass the TCLP test and is broken must be cleaned up and placed in a container. The container must be closed, structurally sound, compatible with lamps, and lacking any evidence of spillage. This advice is applicable to any mercury-containing lamp. In some States, Universal Waste status is lost when lamps are broken and must be handled as a full hazardous waste. It is important to check with your local, state, or federal office for the latest update in regulatory status or go to www.lamprecycle.org. Recommended Broken Lamp Handling Practices: If lamps are broken, ventilate area where breakage occurred. Take usual precautions for collection of broken glass. Do not use a standard vacuum cleaner. Place materials in closed container to avoid generating dust. Think Green From Home is a program by Waste Management established to facilitate the recycling of fluorescent bulbs, batteries and used consumer electronics. In Morris County, a few municipal recycling depots accept fluorescent lamps for recycling by residents. Click here to see if your municipal recycling depot accepts fluorescent light bulbs. Residents can also recycle fluorescents at through the MCMUA's household hazardous waste program. Click here for a listing of Morris County locations (retail, MCMUA and municipal depots) that accept fluorscent bulbs for recycling. Please note, most retail outlets only accept compact fluorescent lamps (CFLs) and not straight tubes. You should call prior to delivering bulbs if you are not sure what the facility's acceptance requirements are. Do not dispose of in the trash. All fluorescent bulbs contain mercury and if broken when placed in the trash the toxic mercury will be released into the environment. Click here to read the Wikipedia entry on compact fluorescent bulbs. Click here to use RecycleaBulb.com to find an outlet, besides the MCMUA, to drop off CFLs for proper recycling. As of 2011, both Home Depot and Lowes provide recycling drop off for both CFLs and tubular fluorescent bulbs in the Morris County area. In December 1996, New Jersey adopted the federal Universal Waste Rule and included batteries, thermostats, and spent pesticides as universal wastes. In 1996 the NJ Department of Environmental Protection (the Department) also began a feasibility study to determine if hazardous waste lamps should be included in New Jerseys Universal Waste Rule. As part of the feasibility study, five (5) facilities (listed below) received an approval to accept hazardous waste lamps as universal waste. The feasibility study demonstrated to the Department that hazardous waste lamps could be safely managed as universal waste. Therefore, the Department has drafted amendments to the Universal Waste Rule to allow all hazardous waste lamps to be managed as a universal waste. The Department proposed the amendments on December 17, 2002. However, on July 6, 1999, the U.S. Environmental Protection Agency (EPA) adopted hazardous waste lamps as a universal waste. The effective date of the rule making was January 6, 2000. Since the Department was in the process of adopting the same rules as the EPA, New Jersey generators of hazardous waste lamps may choose to manage the lamps as a universal waste, in accordance with the EPAs Universal Waste Rule. If a generator of hazardous waste lamps does not choose to manage the lamps as universal waste, the lamps must be managed in accordance with the hazardous waste regulations. 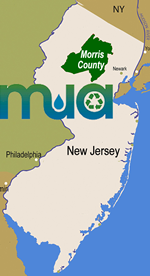 The processing of universal waste is not allowed under the New Jersey Universal Waste Rule without an approval from the Department. The use of any lamp-crushing device would be considered processing. Therefore a generator of hazardous waste lamps would not be able to crush the lamps and still manage the crushed lamps as a Universal Waste. However, a lamp-crushing device may be used to crush hazardous waste lamps provided the crushing is done in accordance with the requirements for the treatment of a hazardous waste in an accumulation container, as set forth by N.J.A.C. 7:26G-6.1 [i.e., 40 CFR 262.34(a)] and 7:26G-9.1 (i.e., 40 CFR Part 265, Subparts I, AA, BB, and CC). If a certain type of treatment in accumulation containers poses a significant risk to human health or the environment, the Division of Solid and Hazardous Waste may require a hazardous waste permit to be obtained for this process. Additionally, it is important to note that the air filter on the crusher must be working properly in order to meet this requirement. The emission of mercury vapors from the crushing unit could constitute a "significant risk to human health or the environment". The requirements for treatment in an accumulation container do not allow for treatment to be performed in a satellite accumulation area per 40 CFR 262.34(c). Therefore, the container in which the crushed lamps are accumulated must be managed in accordance with the requirements applicable to fully regulated generators of hazardous waste found at 40 CFR 262.34(a). In addition to complying with New Jerseys Hazardous Waste Regulations, any generator using a crushing device may need to obtain an air permit for the device. For information regarding air permits, contact the Bureau of New Source Review at (609) 292-9258. There may also be federal reporting requirements under the land disposal restrictions in addition to New Jerseys requirements. For information on land disposal restrictions contact the EPA RCRA/Superfund/EPCRA Hotline at (800) 424-9346. If a generator of hazardous waste lamps chooses to crush the lamps in accordance with the above requirements for the treatment of a hazardous waste in an accumulation container, the crushed lamps would no longer qualify as a universal waste. The crushed lamps would have to be managed as a hazardous waste in accordance with the New Jersey Hazardous Waste Regulations, as set forth at N.J.A.C. 7:26G. Some manufacturers of mercury containing lamps (MCL) currently offer to consumers lamps that contain lower concentrations of mercury as an alternative to the standard MCL. Though some of these new lamps may be considered more "environmentally friendly" and even pass the TCLP test, they still contain what the Department considers a significant amount of mercury. The impact mercury-containing wastes have on the environment and the costs incurred by the New Jersey Municipal Solid Waste Facilities to manage mercury-containing wastes are considerable, so the Department encourages generators of all MCL to manage it as a recyclable material.